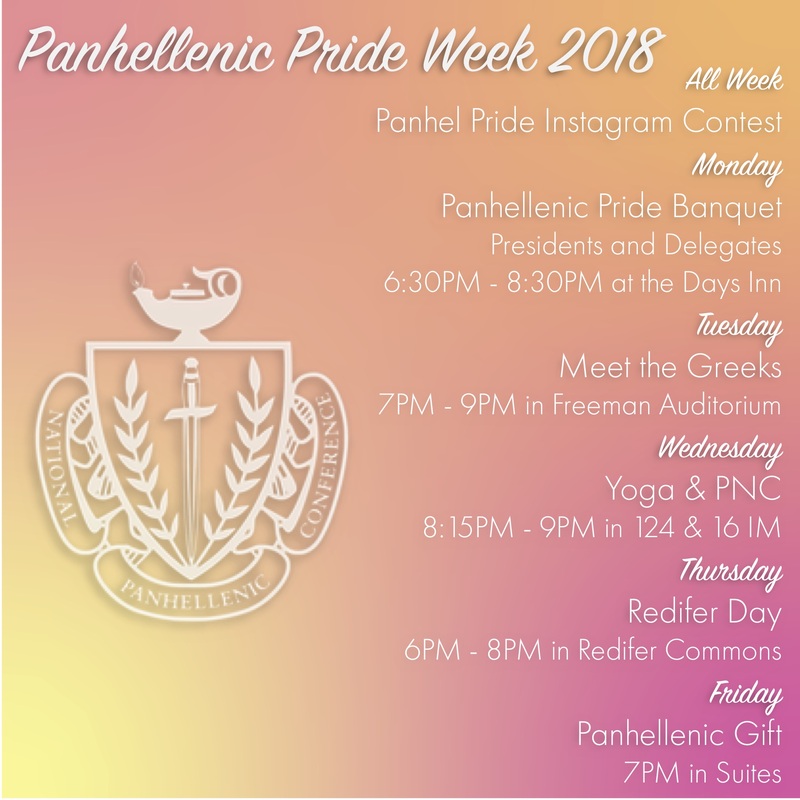 Next week is our Panhellenic Pride Week! Make sure to stop by our events throughout the week! This week is meant to focus on all of the hard work that our chapters do. We are so grateful for our member’s dedication to the Panhellenic community. We appreciate each and every one of you! 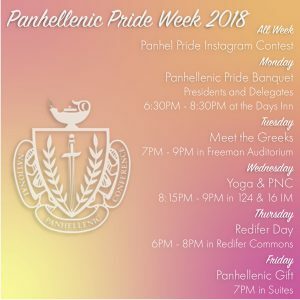 All Week:Panhel Pride Week Instagram Contest. Get the chance to win $250 for your chapter! Tuesday:Meet the Greeks 7PM-9PM in Freeman Auditorium. PNMs will get the chance to learn more about the Greek community and meet the Panhellenic Council! Thursday:Redifer Day 6PM-8PM in Redifer Commons. Stop by to be in our photo collage! There will be candy, raffle baskets, stickers, pens, and other goodies! Friday:Panhellenic Gift 7PM in Suites. Look out for a gift from Panhellenic! View our 2019 Recruitment Booklet! Click on the button below to view our 2019 Recruitment Booklet! Please keep in mind that Tri Sigma will also be participating in Primary Recruitment! Take a look at our page on Tri Sigma here! Primary Recruitment will be opening tomorrow, October 1st, 2018! Visit our Recruitment page for more info on the recruitment schedule, registration link, and important dates and events here! Registration for recruitment will be closing on Monday, December 31st at 5PM. Email our Vice President for Membership, Brooke Martinez, at Membership@pennstatephc.org with any questions or concerns!